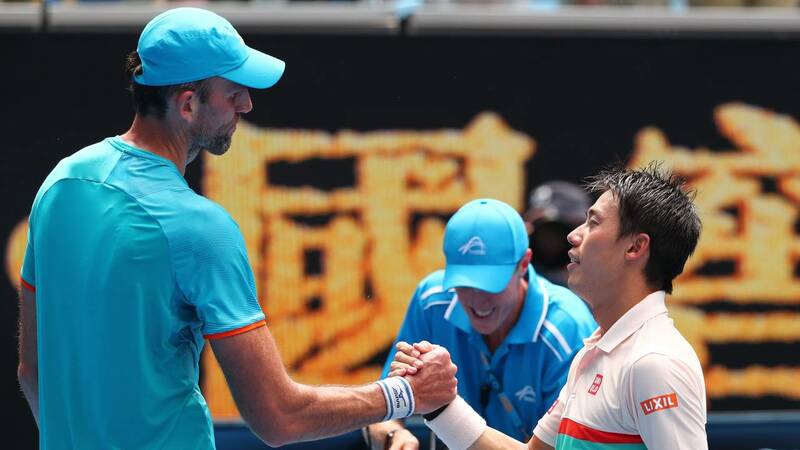 Ivo Karlovic (left) shakes hands with Kei Nishikori following Nishikori's victory in their second-round match during Day 4 of the 2019 Australian Open on Jan. 17, 2019, in Melbourne, Australia. (CNN) - For the second straight day at the Australian Open, a towering player hit 50 more aces than his shorter opponent. This while women's No.1 Simona Halep rallied for the second straight round, beating the surging American Sofia Kenin 6-3 6-7 (5-7) 6-4. "I think he almost had the match, especially in the fifth set, and it was really a tough match," Nishikori told reporters after winning a second straight tussle himself that went the distance. "Very happy to win today. 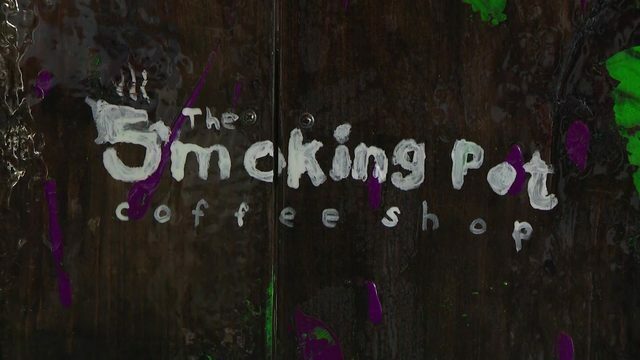 This means a lot." It was conversely a tough defeat for the 6-foot-11 Croatian given his efforts to force a fifth -- and because the 39-year-old led his 5-foot-10 rival by 7-6 in the final tiebreak. It came after 5-foot-8 Thomas Fabbiano edged 7-foot Reilly Opelka in a fifth-set tiebreak Wednesday, despite striking two aces to the American's 67. There were tiebreaks aplenty on center court, too, as 2016 Wimbledon finalist Milos Raonic downed three-time grand slam champion Stan Wawrinka 6-7 (4-7) 7-6 (8-6) 7-6 (13-11) 7-6 (7-5) in four hours to delay the start of Halep's contest. Raonic thumped 39 aces, serving especially impeccably in the last three tiebreaks. Helping his cause was a closed roof -- the sun and wind aren't factors -- necessitated by Melbourne showers. This is the first year the Australian Open has instituted a final-set tiebreak -- up to 10 -- instead of a long set. And if escalating the drama was part of the reason why, it seems to have worked. Nishikori -- the first Asian man to make a grand slam final in 2014 -- appeared in the clear when leading the final tiebreak 6-3. Karlovic, however, took the next four points. Serving or volleying usually accounts for the world No. 73's points -- but forced to guess when Nishikori lined up a short forehand, he anticipated perfectly to place a backhand down the line for 7-6. It was a shot that would have made artist Roger Federer -- the record 20-time grand slam winner -- proud. The crowd certainly enjoyed it. Rather than being the turning point, though, it marked Karlovic's last point. He might ponder subsequently missing a forehand volley -- as well as failing to convert three straight break points at 4-4 in the fifth -- and Nishikori grabbed a lead he would not relinquish by placing a fine second-serve backhand return down the line to prompt another volley miscue. "In the end it was that volley I missed and when I had those opportunities at 4-4," Karlovic told reporters. "It's easy after to say 'I should have done this or that.' I am a little bit sad because I had those chances in the end and it could have went the other way but overall, I was really good out there. "I had chances against Nishikori who is No. 9, so in my old age it's unbelievable." Karlovic left Margaret Court Arena to rapturous applause but said it won't be the last time he'll feature at the Australian Open. Indeed asked how long he would continue to play for, he replied: "Well if it is like this, eight or nine years." Later on Thursday, Novak Djokovic cruised into the third round after beating Jo-Wilfried Tsonga 6-3, 7-5, 6-4. The Serb will now play teenager Denis Shapovalov on Saturday. Kenin -- who won her maiden title in Hobart last weekend -- stormed back by winning a gripping tiebreak and led 4-2 in the third before the Romanian won 14 of the final 19 points. Halep overturned a set and break deficit to get the better of the big hitting Kaia Kanepi on Tuesday. "I had no idea how I won tonight," Halep told the crowd, adding she picked up a minor leg injury in the second set. Her fitness could be called into question in the third round against Venus Williams, although the 38-year-old has played a pair of three-setters, too. Williams saw off France's Alize Cornet 6-3 4-6 6-0. Elsewhere, Williams' older sister Serena thumped a resurgent Eugenie Bouchard 6-2 6-2. Serena -- trying for a record 24th major -- could face Venus in the fourth round.